Destination Of The Week: The Bahamas! If you have your eyes set on the Caribbean, then make sure you check out Bermuda. This fun-loving island has some of the most gorgeous beaches… just check out the color of that water! 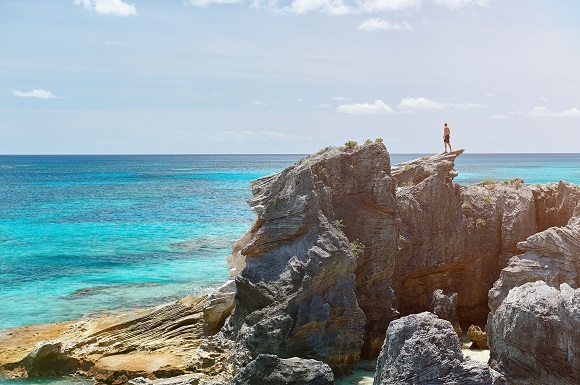 Boasting the best in adventure tourism, warm-hearted locals and some pretty amazing scenery, here’s where to start when planning your Bermuda adventure. The water is so clear here, off the West End, that you can easily spot the hundreds of fish below, swimming around this old shipwreck that just peeks out of the water about a half a mile off the Somerset shore. It’s a great spot to stop if you’re on a boat tour but is thrilling if you want to explore it with some snorkel gear. 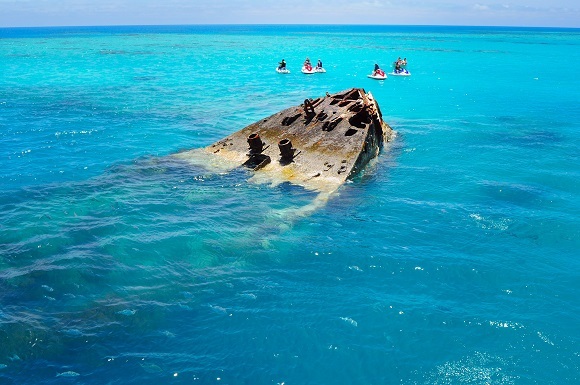 This nineteenth-century British gunboat is just one of more than 300 shipwrecks surrounding Bermuda. As one of Bermuda’s most adventurous beaches, Admiralty House Park is a must for adrenaline-seekers. It’s one of the best spots to cliff-jump on the island, but also great for rock climbing and bouldering and the best part is, if you lose your grip, you’ll tumble into the refreshing and cool water! The cliffs are tall, the water’s deep and the caves used to be used by pirates waiting to attack oncoming ships! Heading to Bermuda with your sweetheart? 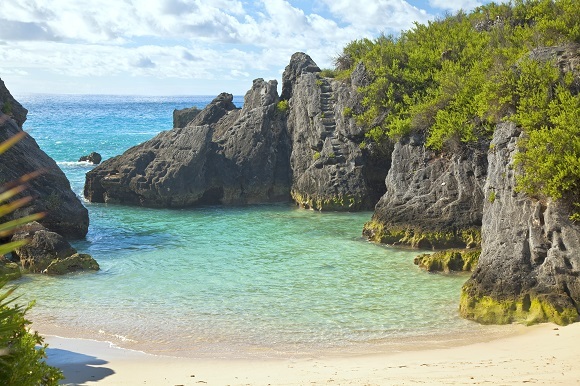 Jobson’s Cove is arguably one of the most romantic beaches on the island and reason enough to book flights to Bermuda. This sheltered cove of pink sand is surrounded by jagged rocks and is a sweet little slice of paradise that feels like it’s a world away from everything else. It’s the perfect spot for a romantic swim or to snorkel with tropical fish. You’ll find this place in South Shore Park, not far from Warwick Long Bay Beach. 4. 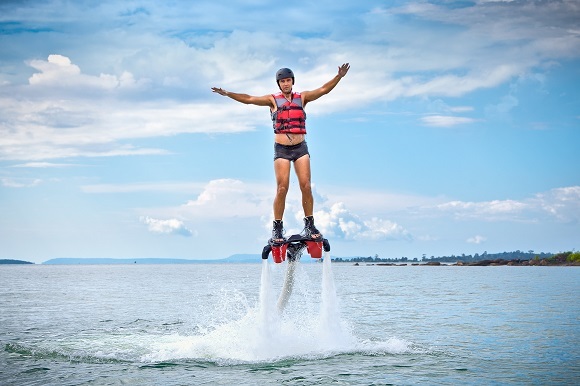 Give flyboarding a shot! If you like to wakeboard or waterski then you’ll love the newest extreme water sport to hit Bermuda’s beaches: flyboarding. You’ll soar 35 feet into the air, the next best thing to flying. “Pilots” are connected to a personal watercraft by a fire hose, while being secured to wakeboard-like bindings. It’s seriously addictive and so much fun! Recommended for ages 14 and over. While the best snorkeling sights are found by boat, there are plenty of spots where you can snorkel from the beach and Church Bay is one of the best. 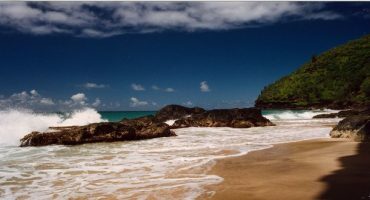 This bay features high cliffs and a ribbon of gorgeous coral reefs that are within easy reach of the shore. All you’ll need is a mask and snorkel, but a pair of flippers won’t hurt either. 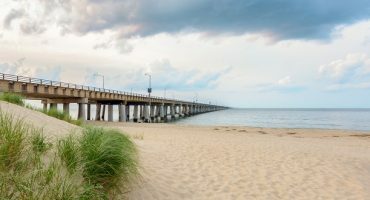 Just watch out, as the South Shore can get choppy at times. 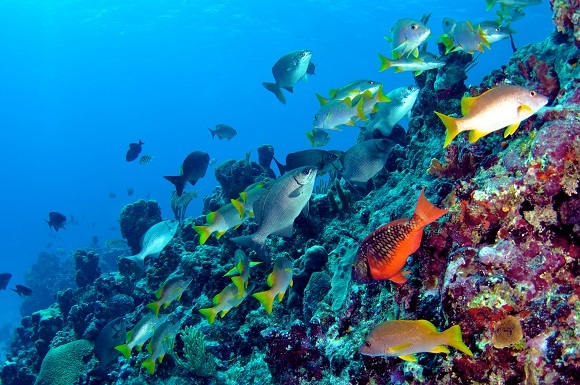 To truly appreciate what you’re seeing underwater, take a trip to the Bermuda Aquarium to learn the names of the fish and get familiar with Bermuda’s exciting underwater worlds. If you’re looking for a little cover from the sun, the Bermuda Arboretum is a lush and lively spot to relax. This 22-acre national park is a stone’s throw from Hamilton and is home to a unique collection of trees, many of which are native to the island, including the famous Bermuda Cedar. 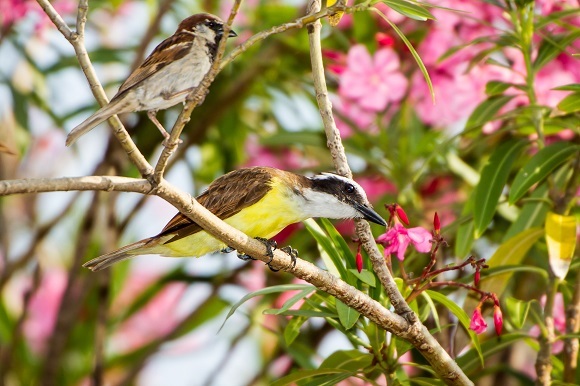 In the trees, take time to look for cardinals, kiskadees and bluebirds. 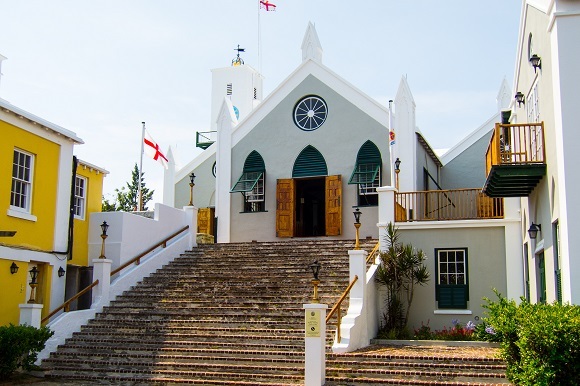 Bermuda is famed for its natural wonders and gorgeous beaches, but the island also has a pretty haunted story to tell, especially the 400-year-old Town of St. George! This is the oldest continuously inhabited settlement in the world, according to its UNESCO World Heritage status. 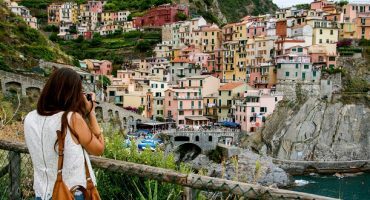 Wander through the historic town’s narrow alleyways and cobblestone streets to meet some of its historic figures on a guided ghostly tour. Love to dive? 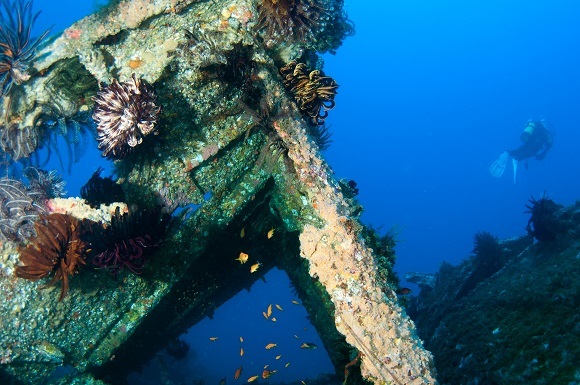 The biggest and most popular shipwreck in Bermuda (and there’s a lot of them!) is this 499-foot Spanish luxury liner. At her time of launch in 1923, the beautiful Cristóbal Colón was the finest of her kind but unfortunately she crashed into a coral reef and sank in 1936. Today the wreck offers divers hours of exploration, scattered across 100,000 square feet on the ocean floor. 10. Relax… you’re in Bermuda! 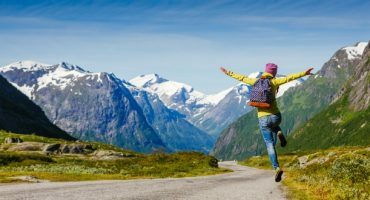 It’s easy to pack a trip with lots of things to see and do but sometimes you need to book in some serious R&R as well. If you’re looking for the best in Bermuda spa treatments, here are a few that you won’t find anywhere else. Get a sweet exfoliating massage with Bermuda honey and cane sugar, or a massage using locally grown aloe. 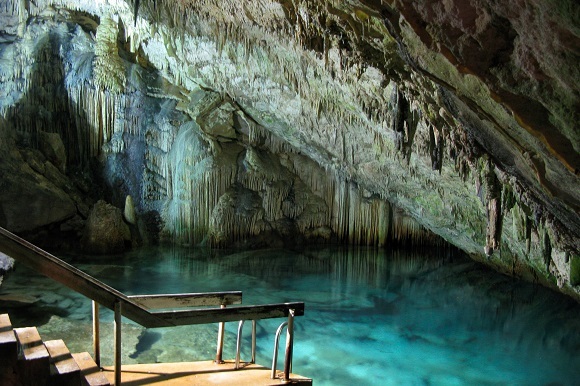 There are also massage rooms in actual caves at Grotto Bay Natura Spa! 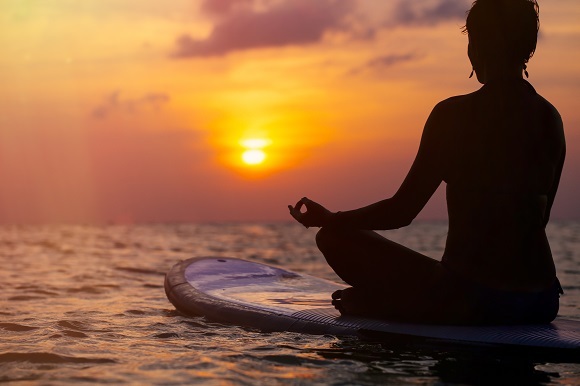 To rejuvenate, try paddle board yoga at sunset.